If you grew up glued to the TV as some of us were, you may remember this funny old lady. You might have smiled as she used her elderly belligerence to implore you to buy a washing machine, but then threw in an interest free period as if to remind you that the kindly granny look wasn’t entirely an act. You might have cringed as she attempted to entice you into her complex from a bubble bath. You might also have wondered whatever happened to Joyce Mayne, the doyenne of discount whitegoods in the dying decades of the 20th century. Just in case we were confused. Born in London, Mayne started out as an actress (and who’s surprised, given those ads) and a tap dancer. She arrived in Sydney in 1956, and the very next day got a job selling TVs at a shop in Penrith. A background in demoing gas and electrical appliances back in England, not to mention being the first woman to pass her all-male management course, didn’t hurt. When the shop owner’s wife learned that *gasp* a woman was selling TVs, she demanded Joyce be fired and replaced by a respectable gentleman. Unperturbed, Mayne went on to a job managing an electrical goods store in the same area, and in 1973 opened three of her own outlets. So great was her devotion to astrology that staff were recruited according to their star signs. “We prefer to employ Sagittarians, Scorpios, Capricornians and Aquarians – they’re the birth signs that produce the best sales people,” Joyce told the Sydney Morning Herald in January, 1979 – the eve of her greatest triumph as a retailer. The ‘Joyce Mayne Shopping Complex’ on Parramatta Road, Auburn opened amid controversial circumstances in early 1980; filling the void left in the electrical retail scene by the 1978 death of Keith Lord, Joyce had the balls to hold the grand opening on a Sunday despite Sunday trading being completely illegal for a company of her size at the time. Damn. By exploiting a loophole in the law – subletting the 25 shops that made up her complex, thereby establishing herself and her tenants as equals – she was able to cash in on the more than 7,000 shoppers the centre would receive each Sunday. The downside? 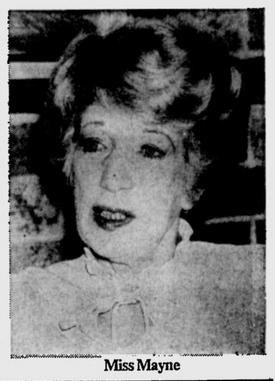 As a tenant, you had to endure the indignity of managing a store with a name like ‘Joycie’s Jean Barn’ (an actual 1982 store name, you can’t make this stuff up), but for Joyce herself, business was booming. Aside from a abortive flirtation with car sales in 1982, Joyce stuck largely to whitegoods and furniture, with locations soon sprouting at Taren Point, Camperdown, Alexandria and Newcastle. So involved was Joyce with the business that you’d often find her manning the registers during busy weekends. I bet you didn’t see Jean Lord doing that. Once she’d created the Joyce Mayne chain, she quickly became a star of Sydney television in a long-running series of commercials. Anyone who watched late night commercial TV between 1978 and 1996 would at some point have caught a glimpse of Mayne’s ads, which showcased a shameless, unique kitsch and a garish sense of glamour, even for that era. This was in an age where furniture and whitegood chain owners all had a crack at fronting their own commercials, thus forcing an unsuspecting public to invite the vacant John Coote or the reptilian Gerry Harvey into their living rooms on an uncomfortably regular basis. Joyce’s borderline offensive commercials, including one involving Mayne enjoying a bubble bath with Mafia types and making them offers they couldn’t refuse, didn’t immediately endear her to the public (something the low, low prices and interest free periods must have done instead). A subscriber to the ‘any publicity is good publicity’ tenet, the ads kept coming despite the public’s distaste. So too the profits – by 1990 Mayne, Harvey and Bing Lee had risen to the top of the industry. The woman herself attributes her winning ways to astrology (and a lifelong love of gambling, particularly on the horses). She took the riskiest punt of all in 1985 when she published Joyce’s Winning Ways, a bizarre part-memoir in which she claimed the stars picked winners. Unfortunately for Joyce, the stars never divined any victory for her own horse, Defilace. In 1986, Joyce began winding down her involvement in the brand she’d fronted for so long, with hopes of retiring to Queensland. She’d spent the year writing a never-released followup to Joyce’s Winning Ways (perhaps she’d discovered a few more) and had fallen in love with the Sunshine State, retiring to Townsville in the late 80s but sporadically appearing in further, increasingly cantankerous TV ads in Sydney. In just a few short years she was calling herself Queensland’s Leading Progressive Astrologer, and claimed she could forecast up to ten years into the future. Given that the ads seemed to stop in about 1996, it makes you wonder…did you see this coming, Joyce? Information on the end of Mayne’s life is scarce; she appears to have died in Townsville sometime prior to 2006, in relative obscurity. This obituary of Bing Lee’s son and Mayne contemporary Ken Lee (d. 2007) mentions that ‘the reclusive multimillionaire was last seen at the funeral of Joyce Mayne‘. Just to make sure she was dead, right Ken? The electrical retail industry is cutthroat, as evidenced by the way Mayne’s turf was carved up after her death. 1998 saw ubiquitous retail overlord Gerry Harvey stepping in to purchase the Mayne stores for his wife to run. There’s something very…misogynistic about that. The Joyce Mayne brand name has since been banished from Sydney, with only a handful of outlets remaining in regional NSW and Queensland. Six of Mayne’s seven ageing stores inherited by Harvey Norman were rebranded Domayne in 1999 and given a more upmarket makeover; gone were the lurid pinks and greens and all the associated tacky charm, replaced with a sleek modern finish and a very cold, corporate feel. I bet there aren’t too many bubble baths in here. And so it is at Auburn, formerly the site of the aforementioned Joyce Mayne Shopping Complex. 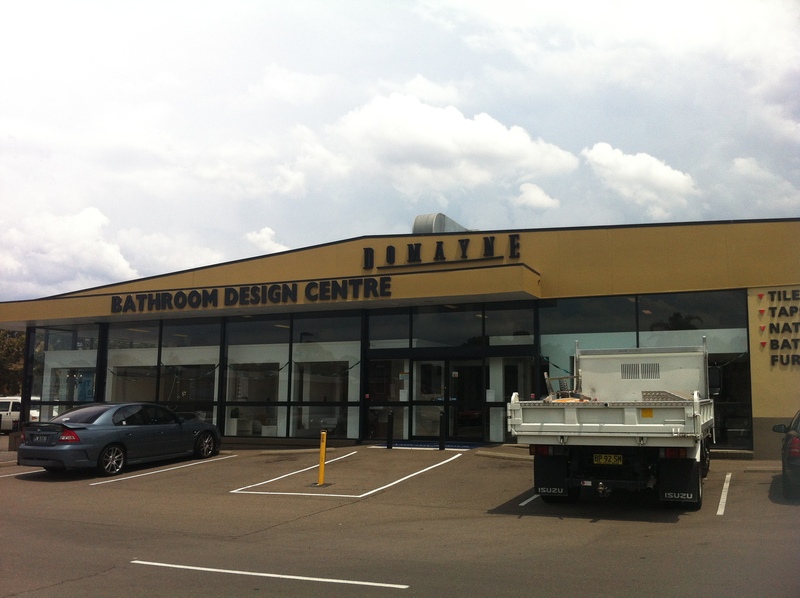 The complex has been largely replaced by a Harvey Norman outlet and the Domayne centre itself…it’s a far cry from the pink and brown monument splashed all over town in Mayne’s commercials throughout the 1980s. But Joyce’s spirit lives on in this, the only feature in the entire complex that still bears her name. 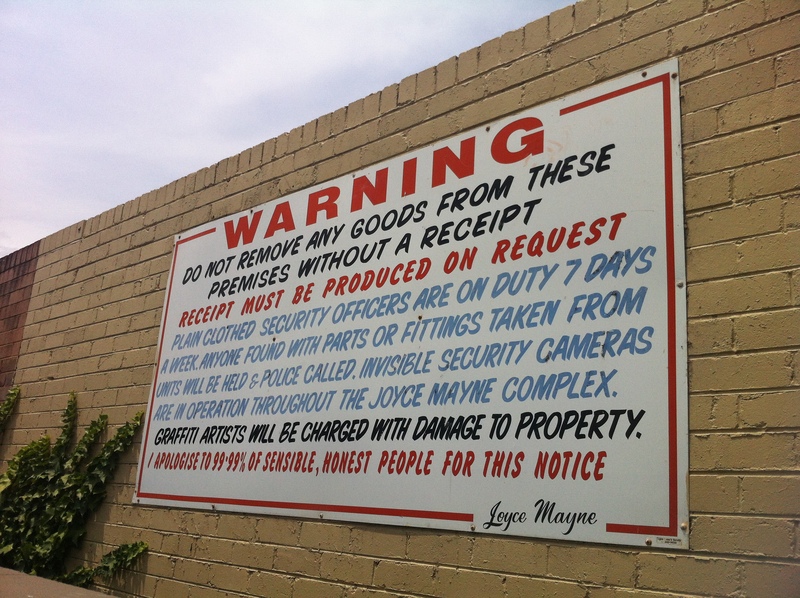 Yes, every time an item is taken away from the premises without a receipt, a part or fitting is pinched from a unit, a graffiti artist damages the property or the 99.99% of sensible, honest people feel the need for an apology, Joyce and her legion of invisible security cameras are there. The brutal juxtaposition of strongly worded threats in a bold, dangerous font signed by Mayne’s dainty typeface is classic Joyce, and wouldn’t seem out of place in one of her ads. Perhaps that life is being lived now, and maybe someday the full story will be told, but for the time being, as always, if you know more, let Past/Lives know. Vaya con dios, Joycie. I have driven past this complex for almost 15 years now and I didn’t even know that there was a massive Joyce Mayne store here. Thanks for the enlightenment, mi vida. The complex at 115/117 Parramatta Rd Auburn was known as Consolidated Appliances. I started work there in early 1966 as their first apprentice TV technician. 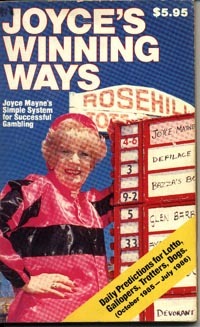 Joyce Mayne started there as a sales lady later on. I left (still named) Consolidated Appliances in 1970 and Joyce was still a sales lady there. The circumstances for the name change to Joyce Mayne Discounts I’m unaware of. Electronic Sales International (ESI) of Annandale and Electronic Rentals of Glebe were subsiduaries of Consolidated Appliances at the time as well. I worked at consolidated appliances for a short time in the late sixty,s , assembling radiograms and faultfinding new tv chassis that the girls on the assembly line had got wrong. I wonder if any of their Consol brand products survive. WOW,,thought I knew a bit on joyce..but you certainly enriched my knowledge on her….loved the ken lee..come back…I knew about jeryy take over and domayne and his wife..
as I said I was a cbie for very long time…I took jerry to the Canterbury races one Saturday after noon..the fare was some thing like $4.65… would you belive he was holding out his hand for the change from a fiver.. so I gave it all in six cents. I can rattle off a few more names that I worked with at the time but probably privacy laws and/or they mightn’t like the fact of being named in a public forum like this. One of the best times that I had working for a company, was with Consolidated. I wish I could speak to a few of them now. You certainly didn’t have to sit up late to see Joycie on TV. I remember her being quite the furniture celebrity in the 80s, her ads were often on TV. I seem to recall an ad where she danced around the furniture dressed as Carmen Miranda (ie: dressed up like a fruit salad). The memory still haunts me to this very day.